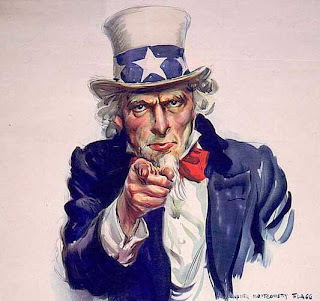 My Money Mission: UNCLE SAM WANTS YOU! It was just absolutely GLORIOUS outside yesterday. The sky was blue and the air smelled wonderful. I hung out a load of laundry and then decided to pick up sticks. That led to bagging up some leaves and then pulling a few weeds. I was out there only about an hour or so, but it really did wonders to "unclog the ol' drain" in my mind! And, it's a good thing I had yesterday, because today it is THIRTY DEGREES here....yeppers, 3-0 degrees.....where did THAT come from?? UGH!!! ﻿Anyway, the article went on to say this, "If you're overwhelmed by your federal taxes this year, the friendly folks at the IRS are offering their help this Saturday. Nearly 100 IRS offices across the country will be open from 9 a.m. to 2 p.m. to aid frustrated taxpayers. IRS personnel will be available to assist with tax return preparation, answer account questions and help with a variety of other issues." The article further states: "To locate an IRS office that is open Saturday, click here"
To read the entire article, be sure and visit http://lifeinc.today.com. If I didn't have my handy-dandy-just-in-the-town-down-the-road Tax Preparer, I would probably be one of those frustrated taxpayers that needed some help. If that is you, and there is an IRS office close by, maybe you should just bop on over there and take advantage of their assistance! Do you need to take a vacation to a warmer climate? I have a couch down here in South Mississippi! We've been wearing shorts and flip flops for about two weeks now! Your right, the photo of Uncle Sam would have made the article! LOL...revjen, I was thinking the same thing.